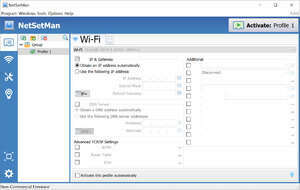 NetSetMan is a useful and small networking utility which can change your configuration settings on-the-fly depending on your location. For example, if you're traveling a lot with your laptop and you're visiting a friend, you can capture, modify and apply the network settings depending on which network setup you're connected to. Practical and free; highly recommended for people always on the go. For security reasons, you should also check out the NetSetMan download at LO4D.com which includes virus and malware tests. Additional screenshots of this application download may be available, too. NetSetMan has a presence on social networks. NetSetMan download been highly rated by our users.